Being a lover of open spaces and rooftops I keep searching for such places everywhere, somehow I saw this place and decided to go over this weekend. 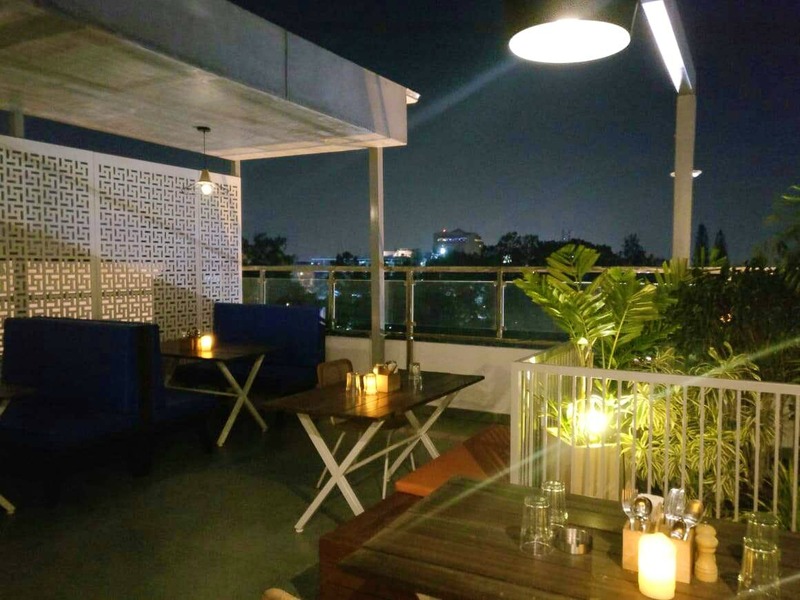 Ambience: Its winter in Bangalore and this place has an open terrace which made it very windy but was totally worth it.I must say its a good rooftop place in Lavelle Road for the Bangalore weather. A beautiful place for couples, family, and friends.Also an ideal place for Candlelight dinner with some soft music. Food: Paneer Tikka – Tandoori paneer tikka served with onion and chutney Jalapeno Poppers – Crispy and crunchy and cheesy poppers served with mayo and potato wedges. Stuffed Mushroom – Fully stuffed mushroom served with chutney. Vegetables Manchurian – this combo is served with salad and noodles/rice. Kadai Paneer – Indian combo served with Indian bread and Kadai Panner. Desserts: Toffee pudding with ice cream – Sticky toffee pudding served with vanilla ice cream which was quite good. Apple Pie – Chocolate Brownie with ice cream – Hot Brownie served with vanilla ice cream. Service & Staff: Staff were friendly and well dressed. Amazing hospitality by Aanand. No words left to praise them. Service was professional and quick and economical on the pocket. Nice place to visit again for fine dine on this beautiful rooftop. Delectable food And A Romantic Charm, This Rooftop Bar Has It All!